I recently participated in the 5th annual Great Food Blogger Cookie Swap and I have to say it was a blast! This was my very first time participating and it won’t be my last. I baked 3 dozen Milk Chocolate Toffee Butter Cookies and sent them to three different bloggers – Secret Santa style. In return, I received 3 dozen cookies – one dozen from three different bloggers. 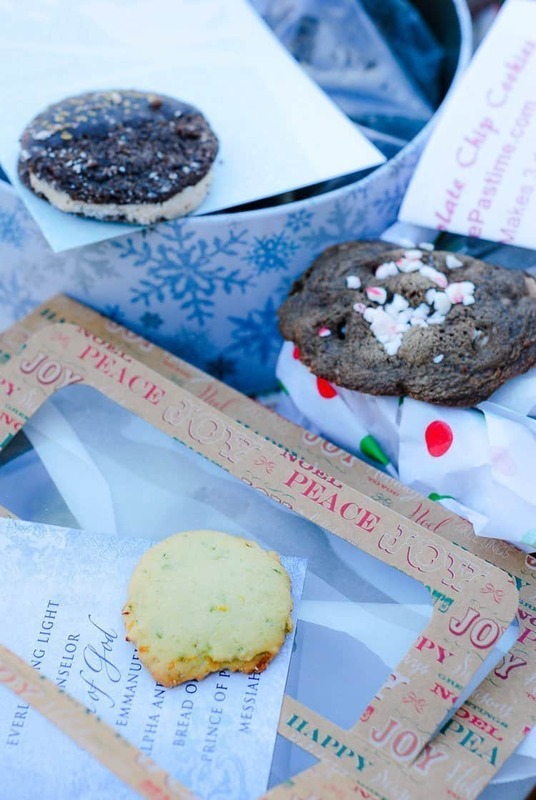 I’ve taken part in virtual cookie swaps before, but I have to admit that looking at the cookies online is just not the same as actually getting cookies in the mail from all across the country. Here’s the recipe for Milk Chocolate Toffee Butter Cookies. Combine sugar, butter, egg and vanilla in mixing bowl. Beat at medium speed, scraping bowl often, until creamy. Add flour, baking powder and baking soda; beat at low speed until well mixed. Stir in milk chocolate toffee bits. Shape dough into 1-inch balls. Roll in sugar. Place 2 inches apart onto ungreased cookie sheet. Flatten to 1½-inch circles using the bottom of a glass. Bake 10-11 minutes or until edges are just lightly browned. Sprinkle with sugar while warm. Cool completely. The best part of the Great Food Blogger Cookie Swap is that all participants made a donation to Cookies for Kids’ Cancer, a national non-profit organization committed to funding new therapies used in the fight against pediatric cancer, which claims the lives of more children in the US than any other disease. By participating in this cookie swap, I not only contributed to the food blogger community, but also supported a great cause. Our sponsors (Land O’Lakes, Dixie Crystals Sugar & OXO) matched our donation to COOKIES FOR KIDS’ CANCER, dollar for dollar (up to $3000). Not only did they match our donation, but I received a stack of coupons from Land O’Lakes, a silicon baking mat from Dixie Crystal and a set of measuring cups from OXO. I have to say that this was the best cookie swap program I’ve ever participated in and can’t wait until next year. 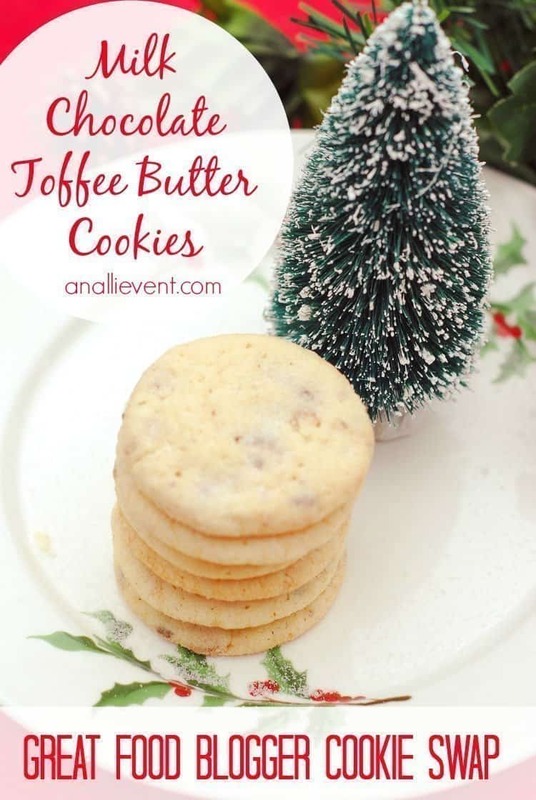 Don’t forget to try my Milk Chocolate Toffee Butter Cookies. They’re a family favorite! What’s your favorite holiday cookie? Alli, your cookies were divine!!! I am a huge toffee fan, so they were perfect! Thank you and hope your holidays are wonderful. There’s something really special about baking homemade treats during the holiday season! I really love these chocolate toffee butter cookies. They sound and look so delicious- I’d love to try them this weekend! 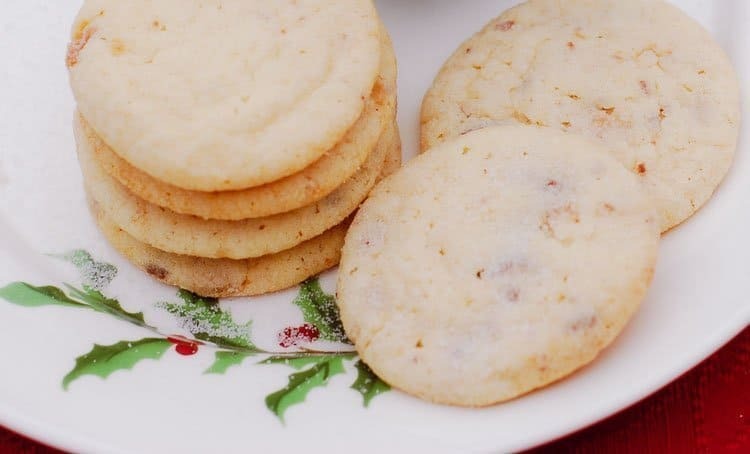 I’ve made butter cookies quite a few times, which are great plain. I love the idea of adding in the chocolate toffee bits too. I may have to make a batch of these for my neighbors. These look so delicious. I love to bake a variety of cookies around the holidays so I always have goodies around for anyone that stops by. Oh men, I wish I could receive a dozen of these cookies, or maybe three dozens. How fun to do this activity and for such a worthy cause, too. That is great that Land O’ Lakes was willing to match such a high amount of $$$. Yummy!! I haven’t even made goodies this year but I am totally adding this one to my list. These look so delicious! How can you eat just one? We love to bake homemade cookies for the Holidays! Butter cookies are always one of the type we make. i might just have to add toffee to them this year.. I love butter cookies! I’m glad to find a new way to prepare cookies. The kids will surely love this. Those look amazing! I am doing our baking next week and I can’t wait to try this recipe! What a lovely idea for exchange! Homemade cookies in the mail! YUM! Oh my sweet yumminess, these look absolutely delicious. I love that you participated in a cookie swap that allowed you to give back to a great cause as well. Warm and fuzzy feels all over this post. This is fantastic! Great recipe. Thanks for sharing this. Must try this Xmas! What a fun idea to do a cookie swap. I bet you got some really tasty cookies. You had me at toffee! YUMMY. I am saving these to make for our get together. Maybe because I don’t bake but I have never participated in such a lovely swap before. Glad your sponsor matched your donation. These Milk Chocolate Toffee Butter Cookies look so delicious. I will have to make these with the kids for Christmas. Thanks for sharing the recipe.